Submitted by 3dhippie on Wed, 2012-04-18 01:57. Unfortunately, I wasn't able to track down the error yet. But please try it again but be sure to have the rtt dialog opened before you run the script this time.also, look if there is a remap component in the dialog and delete it. This forces a reset for the script. I hope it will work then. Submitted by pixhellmann on Tue, 2012-04-17 13:02.
i love the idea and youre script! But i have the same issues here. Win 7 englisch, 64 bit. 3dsmax 2012 64bit. photoshop cs5 extended. it stops when it's back in 3dsmax and should start the baking progress. exactly the same problem like dkreset has it. i hope there is a solution! Submitted by dkreset on Mon, 2012-02-27 12:45. I gave the settings you showed me a spin. It didn't really work either, but I noticed something interesting. I get different results by assigning your script to different parts of max menu. eg. 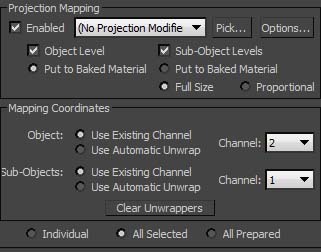 when the script is customized into the quick access tool bar, or the main tool bar where you put yours in the video, the script gets activated when I have the UV unwrap modifier stack selected. However I tried assigning the script to a hotkey today, and it would not activate unless I have the editable poly bottom stack selected. It also then calls out the script editor in photoshop for some reasons. I don't know if this is of any relevance but I thought I'd mention it anyway! Submitted by dkreset on Mon, 2012-02-27 11:41. Submitted by 3dhippie on Mon, 2012-02-27 03:09.
thanks for the screenshots. I can tell easily that something is wrong. All the automatic unwrapping shouldn't be there. I have attached an image with the important settings. If you enter them manually and hit remappsd it will use those settings (so one can also map from channel 5 to 3 or whatever). Please try that and look if it works. Also try to delete the bake element called REMAP. This will force default values. Hopefully one of these tips will help. Although I don't really know why it doesn't bake at all. I will have to dig deeper into the problem if none of the advices were helpful. By the way, I have a fresh windows and 3dsmax install at hands and notice the same wrong behaviour with automatic unwrapping. I will need to do some debugging. Submitted by dkreset on Mon, 2012-02-27 01:24. So I tested at home as well and same thing happened. The maps were not baked and brought straight back to the PSD. When I checked the folders for the baked maps there was nothing in there. I took some screenshot of the settings as well as how I've set the uvs up with the modifier stacks so you can take a look at them. Submitted by dkreset on Sat, 2012-02-25 15:15. This is a great script, definitely worth supporting. I'd be super happy if this is working! Submitted by 3dhippie on Sat, 2012-02-25 07:29.
hey dkreset. Could you send my a screenshot with your render to texture dialog opened (with all rollouts expanded) just after the script failed? That would be very helpful. Submitted by dkreset on Fri, 2012-02-24 15:52. I'm using max 2012 and photoshop cs3! Thanks in advance! If I could get this working it will definitely be a life saver and I will put out my effort to see more scripts like this from you for sure :)! Submitted by ashbcl19 on Tue, 2012-02-21 21:37.